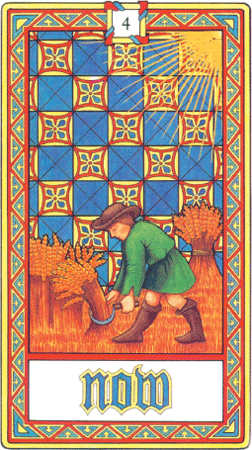 The message of the Now Card for the reader is that the time is ripe for you in aspects of either your inner or your outer life, and the climate is right to act. Important energies never go in straight lines. They work in cyclical rhythms that mirror the seasons of the year. There is a time in our lives for sowing seeds and a time to harvest them. In other words we have always psychological 'windows' we need to exploit. 'Now' is the moment for action and to stop dreaming. The reality is today. The psychological forces that have been germinating within you are ripe an you must bring them to fruition. Make hay while the sun shines.